I'm finishing a charity project, then taking a hooky break. My woodland colors will eventually be made into squares after reading comments here and in the FB group. Sorry to see all the problems some of us are having with the pattern. Ripples have sometimes given me an issue, and from the looks of this one, I'm not touching it. I DO love the colors, though. I keep getting sidetracked and haven't made much progress. I know your squares will be pretty, Judy. They are great colors. This one is on the side lines again for a baby blanket that I need by the end of the month. I'm currently on part 3. Well, once again, this afghan is giving me fits. It has begun curving again. I am completely disgusted and have abandoned this project. I'm so sorry it didn't work out for you! Thanks, Mona. I am disappointed too. I love the colors. Will use the yarn for some other project. Make granny squares - a join as you go project. That would be fun! I ended up deciding not to start another project. Then I realized that I would be happier with the temperature blanket I'm going to start if I have a few more colors to work with, so I'm adding the yarn from Woodland in with that. So it will be used, just not the way I'd planned. I'm finally getting back to this project. 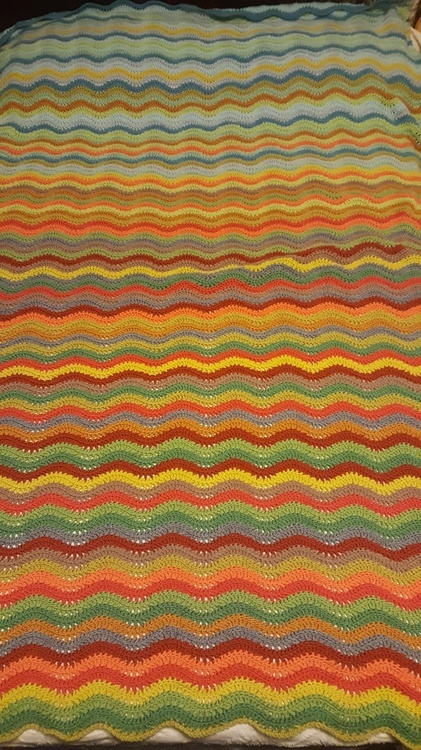 I'm on color stripe # 41 out of 105. The pics are great. My dad had a garden in his back yard much like yours. His tomato plants used to grow head high. I finally finished it! I haven't measured but I'm pretty sure it's bigger than its' supposed to be since I didn't have enough yarn left over for the border. But I'm satisfied with how it looks without one. That's so pretty! Great work Mona!